Arguing over quarterbacks at the top of the board is a familiar pre-draft trope in the fine tradition of Manning vs. Leaf, Couch vs. McNabb, and Luck vs. Griffin. In none of those cases, however, did the debate threaten to bypass the individual subjects and evolve into a broader referendum on who can and cannot be a successful NFL quarterback the way Winston vs. Mariota has. Blame the NFL’s Spread Dread. The last time America debated the relative merits of Marcus Mariota and Jameis Winston, the stakes were obvious, and the criteria for resolving the matter were plain: The winner of their head-to-head Rose Bowl meeting would lead his team to the championship game, cementing his status as the cream of the quarterbacking crop in the process. At the time, Mariota was fresh off a landslide victory in Heisman balloting and had clearly surpassed Winston, the 2013 trophy winner, as the nation’s best college quarterback, a title he reinforced in Oregon’s 59-20 romp over Florida State on New Year’s Day. The contrast on that afternoon could hardly have been more decisive: Mariota was as cool and productive as ever on the biggest stage of his career, while Winston teetered on the verge of a meltdown in his only defeat as a college starter. Four months later, the criteria for settling the second great Winston-Mariota debate are much murkier, but the pre-draft conjecture has been every bit as decisive as the final score in Pasadena. By all accounts, Winston is a virtual lock to become the first overall pick in Thursday’s NFL draft, an unsurprising triumph of his size, skill, and on-field track record over the off-field turmoil that nipped at his heels for the better part of his FSU career. Mariota will come off the board soon after, although exactly how soon is something no one outside of the Tennessee Titans’ front office really knows. If the Titans want Mariota with the second pick, he’ll be there for the taking; if not, the clock on Mariota Watch 2015 will begin ticking in earnest. Arguing over quarterbacks at the top of the board is a familiar pre-draft trope in the fine tradition of Manning vs. Leaf, Couch vs. McNabb, and Luck vs. Griffin. In none of those cases, however, did the debate threaten to bypass the individual subjects and evolve into a broader referendum on who can and cannot be a successful NFL quarterback the way Winston vs. Mariota has. At first glance, Mariota bears all the marks of an ideal prospect: He’s a polished, productive passer with prototypical size, first-rate athleticism, and a spotless reputation as a citizen and teammate. In three years as Oregon’s starter, he racked up a program-best 36-5 record while consistently defying the notion that he was merely another superior athlete who’d been taught to complete a succession of bubble screens; in 2014, he led the nation in yards per pass (10.0), touchdown-to-interception ratio (42 TDs, 4 INTs), and pass efficiency (181.8), all by healthy margins. Unfortunately for Mariota, he also happened to play in a system that’s become synonymous with the modern rise of the spread offense at the college level, and he happens to be arriving on the scene at a moment when the NFL’s zeal for spread quarterbacks, ascendant in recent years, is once again waning. Much of the Mariota criticism boils down to chiding Oregon’s scheme for creating easy completions too effectively to allow us to fairly evaluate Mariota’s arm or decision-making on their own merits. Among the chief “weaknesses” articulated in Mariota’s NFL.com scouting report is that he “benefits from an offense that is predicated on simplified reads. Offense able to create wide-open receivers after busted coverages at times.” Not only were his receivers too easy to find, they were too damn open. Winston has his on-field flaws, an alarming interception rate foremost among them,1 but he also has the size, the arm, and the sterling amateur résumé. More importantly, because Florida State’s offense is generally classified as a pro-style scheme that lacked the crutches associated with the spread, Winston is in no danger of being labeled a “scheme-based quarterback.” In a risk-averse league that expects immediate returns from top picks, that distinction alone has rendered this year’s quarterback debate strictly academic. Winston served up 18 picks in 467 attempts in 2014, more than Mariota threw in his Oregon career (14) in 1,167 attempts. At this point, spread vs. pro hardly qualifies as a novel dynamic in the context of the draft or anywhere else; even in college, where Oregon has won more games over the past five years than any other FBS program, the Ducks’ failure to deliver a national title in that span continues to embolden the last holdouts against the spread revolution. Still, Waldman’s and other skeptics’ basic assumption that Mariota, finely tuned model of a modern spread practitioner, is unlikely to adapt quickly to any offense unwilling to adapt to him is a sobering reminder for spread acolytes of just how much ground the revolution still has to cover outside its natural habitat in the college ranks. Two years ago, the stock for dual-threat and spread quarterbacks in the NFL was as high as it’s ever been. Now, the undulating trajectory of Mariota’s value since the last time he took the field, coupled with the perceived risk he presents, is proof that the dream template for top quarterbacks has not changed, even if some of the league’s offenses have. And if the traditionalists are right about Mariota’s impending inability to transition, that pattern might hold for a long time yet. In the most generic sense, “the spread” is as elastic a concept as it is ubiquitous: In the college game, the label applies as equally to the run-heavy, option-oriented attack at Auburn as it does to the pass-happy Air Raid scheme at Washington State, and to much of what falls in between; the umbrella is so large that even ostensible experts can have a hard time distinguishing the logistics of one spread scheme from the next. When Georgia Tech coach Paul Johnson, steward of arguably the most retro offense in the nation, insists on referring to his disco-era flexbone scheme as a “spread option,” you know the term has lost all specificity. By any definition, though, the broad outlines of the spread have found a home in the pros. In 2014, 61 percent of NFL snaps came from shotgun or pistol formations, up from 41 percent in 2011, according to Football Outsiders. Three-wide-receiver sets accounted for 59 percent of all plays last year, a 10 percentage point increase in the same four-year span.2 For every pro play that begins with two running backs in the backfield, the standard set for more than half a century, four now unfold with a single back or no back at all. And those numbers are almost surely low: Football Outsiders significantly underreports three-, four-, and five-receiver sets because its tracking system neglects to record tight ends who line up wide or in the slot. Like the college game, the NFL has relegated the fullback to an endangered species, limited to part-time work at best; unlike in college, where traditional tailbacks remain as productive as ever, the small handful of NFL workhorses still capable of shouldering 20 carries per game across a full season are short-lived and increasingly expendable. At all levels, tight ends continue to evolve beyond the confines of the line of scrimmage. Meanwhile, the New England Patriots just won the Super Bowl with a passing playbook that looked strikingly similar to Texas Tech’s, and Drew Brees led the league in passing (again) while helming an offense not that far removed from the freewheeling, proto–Air Raid system he ran to similar effect at Purdue. Strictly speaking, we’re well past the tipping point at which every offense is to some extent a “spread” offense, whether it embraces the label or not. But then, the decadelong rift between spread aficionados and spread skeptics has rarely centered on the strict diagnoses of formations, tendencies, and mechanics, has it? To the extent that it still exists, the divide on those fronts is much more easily traversed than it was 10 or even five years ago, when generic spread sets remained relatively novel at the pro level and the read-option was unheard of. The real rift cuts much deeper: The perception of spread offenses as a finesse approach to a game built on rugged power remains more entrenched off the field than in the actual product. From the beginning, the concept of the spread has represented a challenge to real football — that is, to the Platonic ideal of the two-back, two-receiver schemes that had defined most of the previous half-century, specifically the West Coast–inspired version of that blueprint that colonized the NFL in the ’80s and ’90s. More to the point, as spread offenses began to proliferate in the major college ranks, they seemed to mount a collective argument that there is no ideal. For early adopters, spreading the field was akin to asserting that the “right way” to play the game is whichever way works, even if certain aspects of a given approach fly in the face of two generations’ worth of accepted wisdom. Predictably, even as NFL outfits have begun adapting spread formations and concepts, they’ve been much more reluctant to throw the old orthodoxy overboard, and slower still to change their template for what an NFL offense, or an NFL quarterback, looks like. On the one hand, it’s true that with each passing season, the league looks less and less like the house Bill Walsh built. On the other, it’s also true that the NFL still views many college innovations as inherently transitory and unsound — as mere gimmicks, just a few simple tweaks away from being exposed by the genuine article. While that strain of complacent skepticism is nothing new, it’s rarely been as potent as during the conversation about Mariota, if only because so few other “spread” quarterbacks have been regarded highly enough by scouts to earn this kind of round-the-clock scrutiny. All prospects face sophisticated critiques of their talent and mechanics; with Mariota, though, the most persistent questions have been less concerned with his footwork than with his basic temperament and suitability for the pro game. Can he learn to take a snap from under center? Never mind that an increasing majority of NFL plays are now run from the pistol and shotgun. Can he command a huddle? Never mind that three of the league’s most productive offenses (New England, Denver, Philadelphia) have frequently deployed no-huddle and up-tempo tactics with good results. Is he vocal enough in the locker room? Is he, you know, too nice? Is he, deep down in the core of his being, an alpha male? Never mind that he managed to lead well enough to shepherd his team to 36 wins in three years. Arians’s critique of college-style signaling also overlooks the fact that, unlike NFL quarterbacks, college QBs don’t have the benefit of direct radio communication with coaches between plays. Admittedly, the fate of quarterbacks who don’t fit that mold coming into the league has been grim. Vince Young, arguably the most transcendent college quarterback of the new century, turned out to be a square peg in an NFL offense and failed to progress beyond initial flashes of raw athleticism. Fellow college revelation Cam Newton has proven to be a competent pro, but not yet a dominant one, and if he ever achieves that status it will likely be within the confines of a conventional offense, à la Donovan McNabb. The staggering rookie promise of Robert Griffin III, betrayed by injuries, currently resides somewhere at the bottom of the toxic swamp that is the Washington locker room. 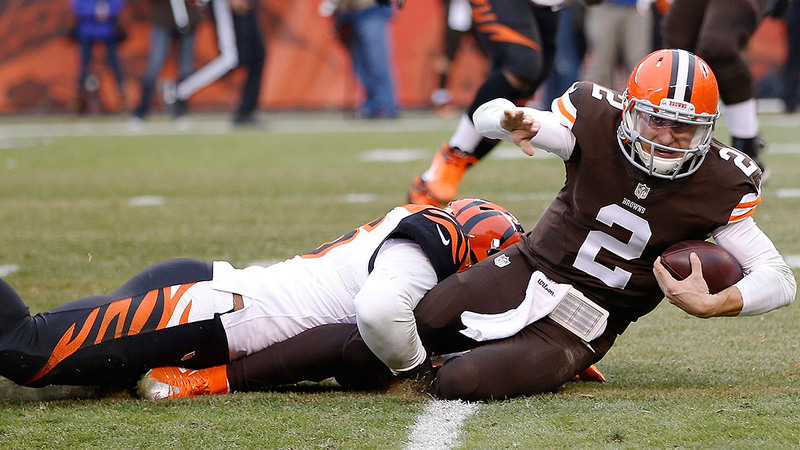 Johnny Manziel’s career is still trying to find the runway in Cleveland. Even Colin Kaepernick, the most promising (and well-compensated) of this generation of dual-threat quarterbacks, seems to be making a concerted effort to redefine himself as a traditional pocket passer. The brief gust of momentum for mobile quarterbacks that Kaepernick, RG3, and Russell Wilson generated in 2012 has largely dissipated before any of them turned 28 years old. Despite the ominous rhetoric, not everyone in the league holds Mariota in the same dubious esteem that Arians and other spread skeptics do: It’s a foregone conclusion that some team, likely a very bad one, will bet millions on Mariota as a long-term solution. No one who stands to become the cornerstone of a franchise is an underdog, especially when he has a Heisman Trophy at home. Still, the NFL’s larger anti-spread narrative has heavily colored the discussion about Mariota’s pro potential despite the fact that he was never a run-first quarterback at Oregon, and that his arm strength arguably puts him closer to the standard NFL model than most of the would-be spread messiahs who preceded him. In an ideal scenario, Mariota will land in a city like Philadelphia, where the weather fits his clothes, and the NFL will get its first taste of a true spread marriage uniting quarterback and scheme. Frankly, the time for that experiment has come. 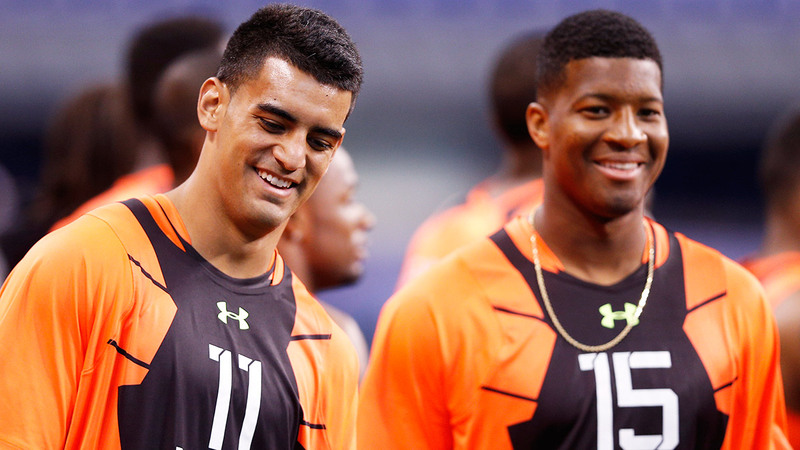 But the $20 million question is this: How will Mariota fare if he winds up anywhere else? Too many shotgun-bound, dual-threat types have passed through the pro ranks in the past decade to plausibly paint any individual prospect as a canary in the coal mine; Mariota is not the first to face the skepticism of the NFL’s entrenched assumptions, and he won’t be the last. If any quarterback can transcend the spread stigma, though, surely it’s Mariota, who has everything the league says it wants in an incoming signal-caller except the pro-style pedigree. Fairly or not, his eventual success or failure will be instrumental in determining how the league greets the next lavishly decorated spread phenom who comes along. Because if Mariota can’t be expected to bridge the gap, who the hell can?